Liquid hydrogen is being used to fuel expelling practices. 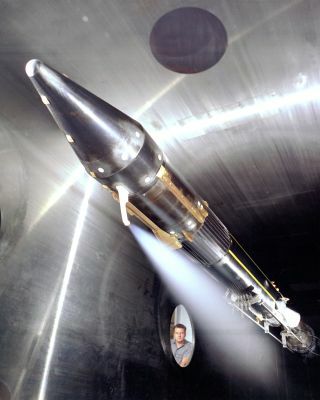 In this historical photo from the U.S. space agency, a vent flowing cryogenic fuel and T/C Rake are mounted on a 1/10 scale model Centaur in the l0 x l0 Foot Supersonic Wind Tunnel in September, 1963. The fuel being used is liquid hydrogen. The point of the test is to determine how far to expel venting fuel from the rocket body to prevent explosion at the base of the vehicle. This vent is used as a safety valve for the fumes created when loading the fuel tanks during launch preparation. Liquid hydrogen has to be kept at a very low temperature. As it heats, it turns to gas and increases pressure in the tank. It therefore has to be vented overboard while the rocket sits on the pad. The test is being run at the Lewis Research Center, now known as John H. Glenn Research Center, Lewis Field.